Back in November 1981, whilst freelancing as a publicity stills photographer in the UK for Thames Television, I was assigned to an episode of the Agatha Christie drama-murder series which was on location for a week at the famous Bluebell Railway in East Sussex. During the lunch breaks I was able to do a bit of my own photography… basically shooting “stock” images to add to my personal files of the world famous preserved steam railway. I was also a scale model railway enthusiast and used to fiddle away with wagon kits and bits of buildings or scenery for an hour a day to keep for relaxation… but I have to admit that being next to, listening to and smelling the real thing is something else! One lunch hour was extended because the weather, being particularly overcast with a fine drizzle blowing in, was imposible for filming continuity. However, the light was flat, soft and from my point of view ideal for product photography. And what a product… a 100 tonne oily, steel machine, belching smoke and steam, namely the Southern Railway Maunsell U-Class 2-6-0 Mogul #1618. Having covered general views of the station, train, actors, extras and publicity shots of the action on 35mm throughout the working day I was keen to set-up my 5×4 inch Wista field camera and look at the potential, in my own time, offered by the locomotive’s very interesting valve gear. I used to carry two large-format lenses in my camera-bag… a wide-angle Nikkor 90mm f/4.5 (equivalent to 25mm lens on 35mm format) and a slightly long standard Nikkor 210mm f/5.6 (60mm on 35mm) which more or less dictated a viewpoint from on the tracks with the wide-angle, or from the platform across the tracks with the long standard lens. The track view was absolutely out of the question for safety reasons whilst another locomotive was in steam and close by, so I opted for the safe viewpoint of the opposite platform and settled on the 210mm lens for the image. Take two… should have been three! Half surprisingly, or maybe as expected, one sheet developed in Kodak HC-110 dilution “B” produced a thin negative… so I processed the second sheet for 33% longer than the original development time. Although I still had a thinnish negative it was just about right for the dark, heavy effect I visualised. In the darkroom my main problem was extracting maximum information from the negative. 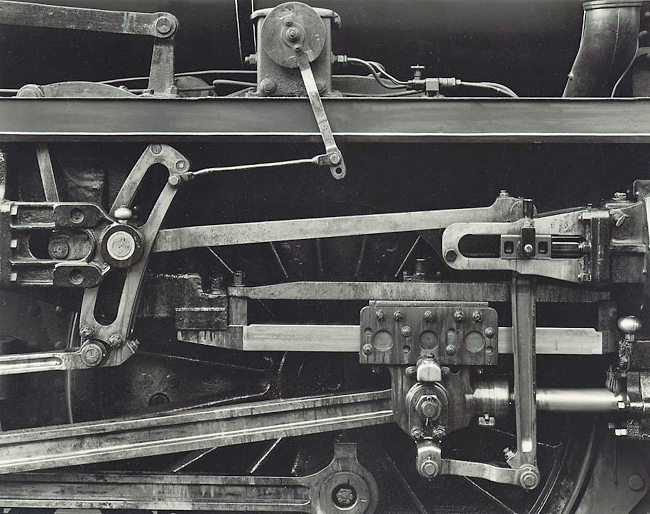 Repeated test prints indicated paper grades between 3.5 and 4.5 and an exposure time around 10 seconds in order to bring out some separation between the shiny steel valve gear and the much darker, shadowed wheels and loco frame. However, that was with my original 5×4 inch Durst condenser enlarger and my method of working back in 1981 when I took the shot. Roll on almost twenty years to the late 1990s and I’d purchased the latest very expensive Durst 1200 Laborator Multigraph closed-loop enlarger for up to 5×4 inch negative film sizes and installed it in my Welsh darkroom. I wouldn’t exactly say that my past umpteen years of monochrome printing had been a struggle (far from it, because final arrival at a great destination is always more appreciated after a long journey), but to literally swish the Multigraph’s exposure probe across the projected image on the baseboard easel and be instantly presented with a set of figures on the computer console indicating, in this negative’s case, a recommended paper grade of 2.8 (slightly harder than a normal grade) and an exposure time of only 2.54 seconds with my 150mm f/5.6 El-Nikkor two stops down to f/11, struck me as unbelievable. Had I pre-programmed the manufacturer’s specific paper data into the Multigraph’s dedicated memory channel incorrectly? Or had I been printing completely haphazardly for the previous, well, almost too long to think about in terms of many thousands of sheets of paper bought and used as well as bodged and binned! However, I exposed a 16×12 inch sheet of my favourite Agfa Multicontrast Classic at the saved computed setting, processed the print (unseen) in a Nova Quad slot-processor for the recommended time… then viewed the print with incredulity. I cannot remember having achieved what I still regard as a perfect “straight” result first time, especially from what I had always previously regarded as a “difficult” negative. There’s not much more to say really… the processed print was toned for 5 minutes in Fotospeed Selenium Toner diluted at 1+9, washed for 30 minutes and air-dried overnight taped to a board so it stretched flat. It is not really possible to feel the strength of the image on a PC screen at 72 or 90 dpi… but viewed properly the print demonstrates the advantages of the large-format regime of 5×4 inch sheet film coupled with a programmed “closed-loop” enlarger. If you are a large-format photographer, or loco buff, and are interested in owing a limited print of this image I still have three archival selenium-toned silver gelatin prints from the 1999 Edition of ten (my best edition, and unlikely to be reprinted again in the forseeable future as I now don’t have a darkroom). It’s a 12×9.5 inch image on 16×12 inch paper priced at only $150 including postage to anywhere in the world. Image & text © 1981-2012 Ed Buziak.